I'd say a good portion of my work wardrobe is borrowed from the boys, including this one. A number of subtle details soften this look, giving it a feminine spin. Here's the breakdown. 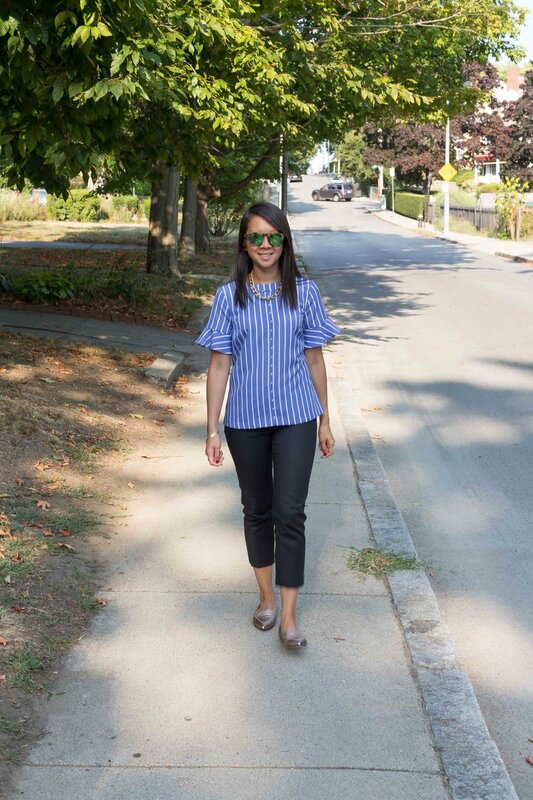 Blue Striped Shirt: Walk through the financial district and I can guarantee you that about 75% of the men, if not more, don the office uniform consisting of a blue or striped (or both!) button down. But for this gal, I traded in the buttons, stiff collar and crisp cuffs for a softer neckline, piping down the front of the shirt and soft flutter sleeves. Trousers: Most men, in my observance, own a number of dark-colored pants. My husband was among them (although he's now traded them in for jeans). I too own a handful of them but to separate myself from the guys, I like my pants to be a bit on the fitted side. Who needs the added bulk? Loafers: I've always been a fan of loafers for men and women. Although borrowed from the boys, I like mine pointy and shiny. What are some of your fave borrowed from the boys pieces? Mirrored Sunglasses: Westward Leaning (old). I found a similar pair by Westward Leaning on ShopBop, $185. If that's a bit steep, check these out from Forever21 ($5.90). Chain Link Necklace: I picked this up at a consignment shop in Lambert, PA a few years back. Here's a similar piece from Charming Charlie, $13. 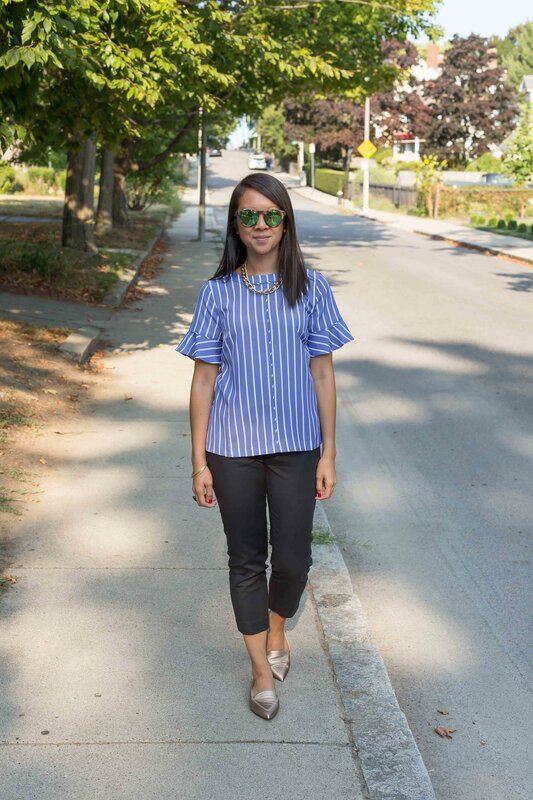 Flutter Sleeve Top: Banana Republic. I purchased this during an F&F event for $37! This exact one is sold out online. You may want to check out the nearest BR store. Trust me, it's worth the hunt! Cocktail Ring: Rebel by Waterford, $75. Pants: This particular style is no longer available (got it on sale). However, my fave fit from Loft is the Marissa Fit. Loafers: c/o M.Gemi (Stellato in gold shimmer). Don't forget, use code "linda201" (lowercase L) to save $40 of this pair or any first purchase from M.Gemi. For other budget friend options, check out these from Cole Haan ($99.95 sale) or TopShop ($68).